Here are few examples of articles I have written and some more technical copy right at the bottom. Please scroll all the way to the bottom. Most people will know about British comedy institutions such as Monty Python’s Flying Circus, Benny Hill or more recently Ricky Gervais’ ‘The Office’ however there are some other British comedy gems out there that demand more attention than they get … and these are the 6 best British comedies you may not have seen. *opens in web time machine (might take a moment to load). Do you want to be cool? Do you long for the respect and admiration of random strangers and your own friends? Do you long for friends? Do you want girls to realize how popular you are? Do you want girls to merely acknowledge your existence? If you answered yes to any or all of the above questions, then you will find the following article of great interest. Here at Becks.com there’s no one even remotely qualified enough to write a “How To” on being cool, however that’s not the case for our friends at AskMen.com. This was a Gif article, which at the time drove tremendous traffic to Morphsuits.com and was very popular. Amy was born with a heart condition, atrial septal defect, also known as a hole in the heart. Always tired and out of breath, Amy's heart condition wasn’t picked up until she was 13. For years she was known as ‘lazy Amy’ – always tired, always sleeping, out of breath, and never knowing why. 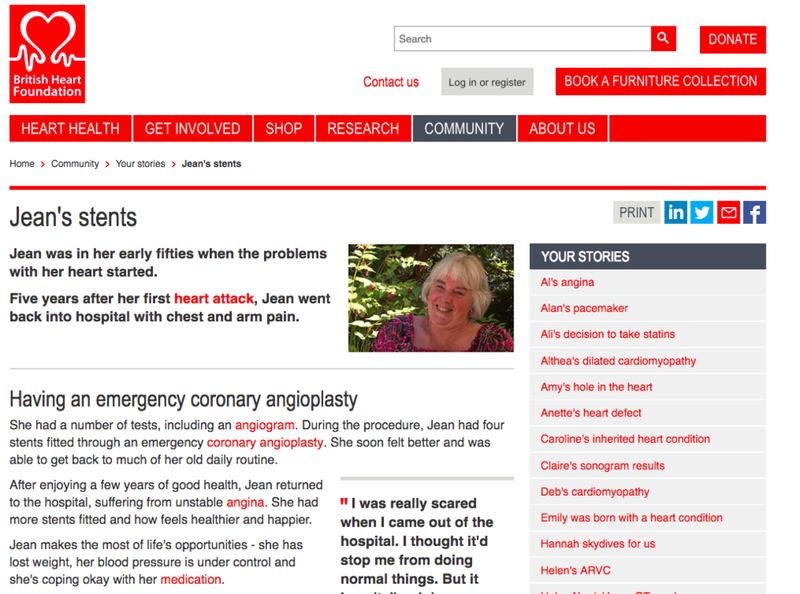 Jean was in her early fifties when the problems with her heart started. Five years after her first heart attack, Jean went back into hospital with chest and arm pain. I wrote all of the copy for the FAQ's, T&C's and Game Guidelines. I was tasked with making the copy succinct and user-friendly. I was also responsible for the copy layout and presentation.